BravoDate.com looks exactly like VictoriaHearts.com and Charmerly.com. The reason they look exactly the same is because all three websites are owned and operated by the same people. And, unfortunately since they’re owned by the same people we’re going to explain piece by piece exactly why in our opinion we would not trust this website. You can read the full review of Charmerly.com here, and our review of VictoriaHearts.com. From what we’ve gathered so far it looks like Bravo Date is going to run along the same lines that Charmerly and VictoriaHearts did. Read the full investigative review below. Why Is Every Female On Bravo Date Beautiful? BravoDate.com is a very interesting place. Not interesting in a good way but interesting in a bad way. The first thing that we noticed when we logged into the members area of the website was that all the women were amazingly beautiful. Most women on the website look like models. Not only are they very beautiful but the photographs are professionally taken pictures. And we find that very strange. If these women are from the Ukraine and Russia (supposedly poor countries) how is it that the photographs are taken professionally from a photographer first of all. Why would a girl pay a photographer to take professional pictures of her? To answer that question we went to the terms and conditions page where they talk about something called “Validated Members”. In section 7 of the terms page and in section 12 they talk about what exactly are “Validated Members”. “Validated Members” according to their terms page are dating profiles that have been purchased from local service providers. They purchase dating profiles of supposed local Ukrainian women and then those profiles and all the information including the photographs are then uploaded to BravoDate.com. As ridiculous as that all sounds it’s very true if you go and look at the terms page. It doesn’t really make much sense that a dating site needs to buy dating profiles until you start understanding how their whole operation works. The first thing they do is purchase dating profiles of attractive Ukrainian women and then from there if you want to try to communicate with these women you need to purchase credits. The problem we have is that we don’t even know if we’re really talking to the women in the profiles or if their dating profiles were simply purchased in order to make the website look like there is lots of beautiful Ukrainian women looking for relationships. Below we’ve included a screenshot of the profile page that we’re using for our investigation. 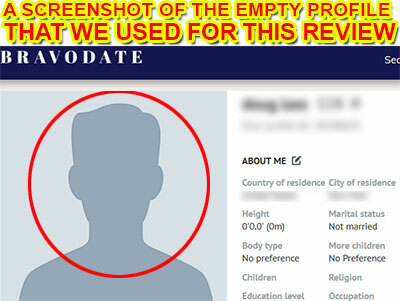 As you can see circled in red we haven’t uploaded any profile picture to our profile page. But as we we’ve already shown you we’ve received 100+ messages. Can anyone explain why over 100 beautiful women would go out of their way to contact a person who doesn’t have any pictures on his dating profile? And obviously the answer is that there are no real females sending us messages. These are all automatically generated fictitious Icebreaker messages. It’s all one big trick that’s used to mislead us into purchasing credits thinking that we can possibly meet up with various women sending us messages. But of course we can never meet these women because these women are not sending us any messages. 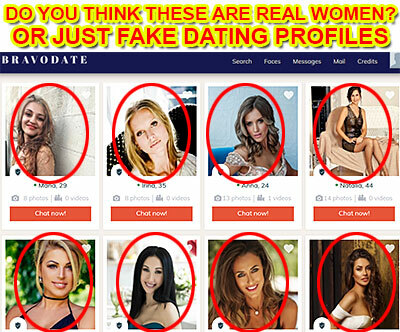 Messages are automated and the dating profiles (Validated Members) have been purchased from some sort of dating profile provider that actually sells dating profiles to BravoDate.com. The terms and conditions has all kinds of crazy information that will shock you. Most of it we’ve already talked about in this report. Things such as the fact that they buy dating profiles from other 3rd party contractors and companies. They also use these dating profiles to send automated “IceBreaker” messages etc. You can read the most important parts of the terms and conditions page below or click on this link to be taken directly to their website. Section #7F We may allow our Validated Members (as defined in Section 12 (Suppliers. Validated Members) below) to choose to send the same message (an “Icebreaker”) to a number of other Members, who are selected by an automatic algorithm in order to allocate the attention and activity among Members of our Service. You may receive Icebreakers from the same Validated Member more than once. Icebreakers may be sent through the same channels as ordinary messages, including as a chat message and as a letter. Is there a point in joining BravoDate.com when they’re actually telling us that they purchase dating profiles from other companies. Real dating sites don’t work that way. Real dating sites work by letting whoever wants to join the dating site join it. They also admit to using automatically generated messages (Ice Breakers). We strongly suggest you think twice about spending any of your hard-earned money on purchasing credits to communicate with nonexistent women.